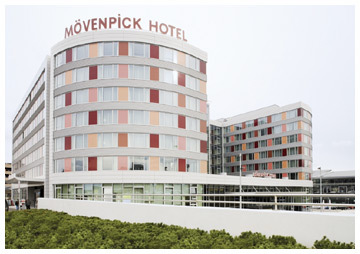 The new Mövenpick Hotel Stuttgart Airport, a 4-star superior business hotel with 326 modern rooms and suites in the immediate vicinity of the new exhibition centre, is set to open its doors on 4 October 2007 after a construction period of only 19 months. 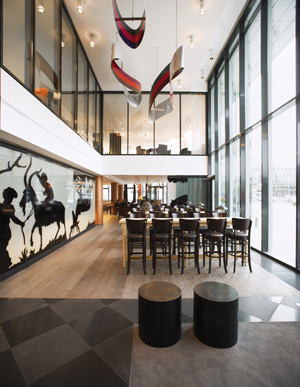 The new hotel boasts a wealth of delightful and unique design elements. The Swiss international hotel chain will now have two hotels at Stuttgart Airport. The location of the new Mövenpick Hotel Stuttgart Airport could not be more attractive. The airport, a mere fifty metres away, can be accessed on foot across the new boulevard, and Stuttgart's new "Landesmesse" exhibition centre is only 200 metres away. With the motorway link the hotel is also easy to reach by car, and there are plans in place for the building of a new ICE railway station. The Swiss hotel group's existing hotel, built in 1983, has been renamed Mövenpick Hotel Stuttgart Messe and is only fifty metres from the new flagship. "The existing Mövenpick Hotel has acquired an outstanding reputation in all these years thanks to its high service quality and culinary competence," says Jürgen Köhler, General Manager of the two Hotels in Stuttgart and Regional Director for Germany. "The new Mövenpick Hotel Stuttgart Airport opens up many new opportunities for synergetic effects, and once again we shall be combining genuine Swiss hospitality with Swabian geniality." The 326 spacious rooms, including twelve 49 sqm Junior Suites and two 73 sqm Suites, offer all the amenities of a modern business hotel: lots of natural daylight, fresh colours and comfortable furnishings chosen to create a distinctive cosy atmosphere. The architects have left their unique imprint both here and throughout the hotel: from the black slate in the bathrooms to the red leather in the reception area, contemporary materials, colours and light effects are on display everywhere. Restaurant Trollinger, with seating for 174 diners, serves a wide range of regional specialities alongside international dishes. The culinary offer is rounded off by a fireplace lounge, a café and the Message Bar. 16 multifunctional conference and seminar rooms for a maximum of 500 delegates are designed with lots of natural daylight and state-of-the-art technical facilities, providing a high level of modularity and quality to suit all types of events. 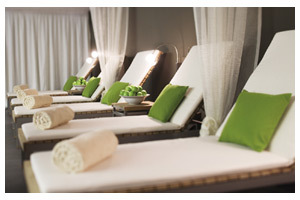 The 400 sqm Gym & Ease leisure area is the ideal place to unwind and work out. Saunas, a steam bath, an ice fountain, beauty treatments and massage applications, and a spacious fitness area with the very latest power and endurance apparatus are all there for guests to enjoy. "The perfect location at Stuttgart Airport itself and the new Landesmesse exhibition centre will make the new hotel very attractive for a growing number of visitors," explains Stefan Flury, Senior Vice President Europe Mövenpick Hotels & Resorts. "After Frankfurt and Hamburg this is now our third successful new opening in Germany in the space of only 16 months. The next step is the opening of the Mövenpick Hotel Düsseldorf next year." Mövenpick Hotels & Resorts (MH&R), a premium hotel management company with over 12,000 employees, is represented in 25 countries with over 80 hotels existing or under construction and focuses on its core markets in Europe, the Middle East, Africa and Asia. The international hotel group with Swiss roots is forging ahead with its expansion and aims to extend its portfolio to include 100 hotels by 2010. MH&R has an established presence in the 4 and 5-star segment with two types of accommodation: business and conference hotels and holiday resorts. In keeping with its slogan "True Excellence in Swiss Hospitality", the hotel chain is a byword for the uncompromising quality of its products and services. The hotel group is owned by the Mövenpick Holding (66.7 %) as well as the Kingdom Group (33.3 %).